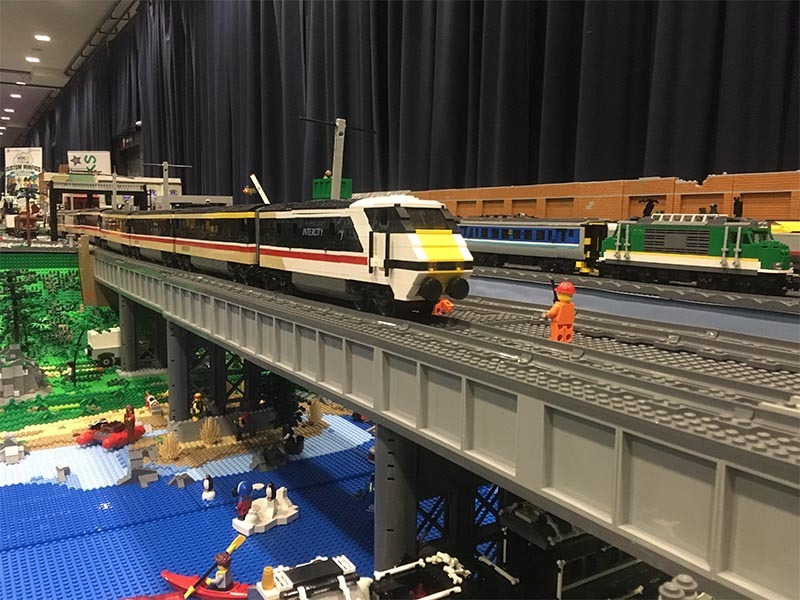 LNUR wouldn’t much be much of a LEGO railway display group if we didn’t also build landscapes out of LEGO bricks for our LEGO locomotives and rolling stock to run on! Members are always developing new scenery, so keep an eye out at future events we’re attending! This as-yet unnamed LEGO model by member Jack is truly magnificent! Not based on any particular real building, it features four platforms under a curved canopy. The station’s architecture is something to behold – a true showstopper! The station also has a “disco mode”, featuring changing interior lighting. 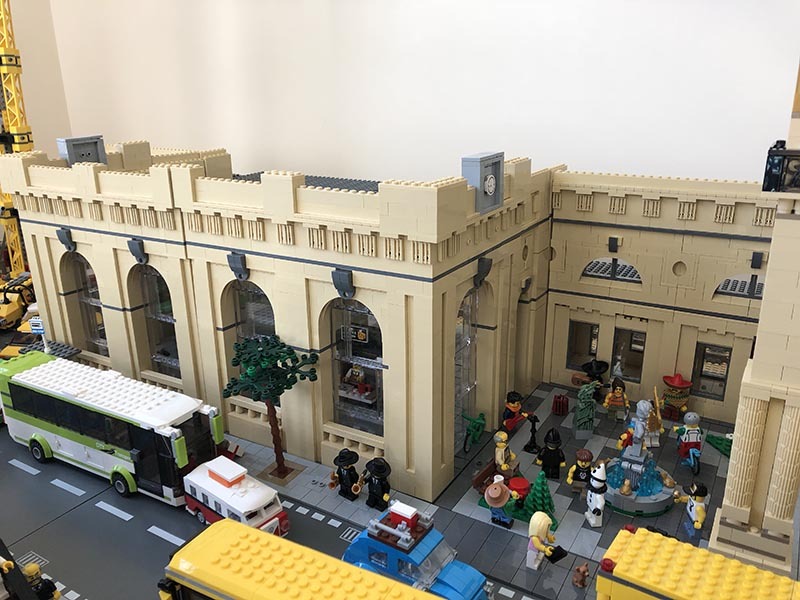 Built by member Richard Carter, this LEGO model of Newcastle Central Railway Station is still a work in progress 4+ years after its start! 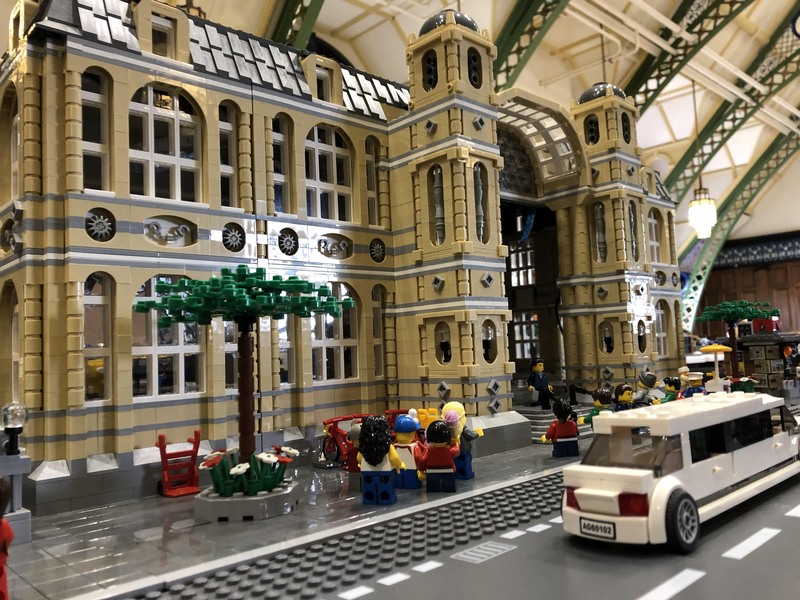 It has appeared at a few shows over the years, including Bricktastic in Manchester. The station model features a full interior including public concourses and retail units. When not at LNUR displays, this forms part of Amchester LEGO City. 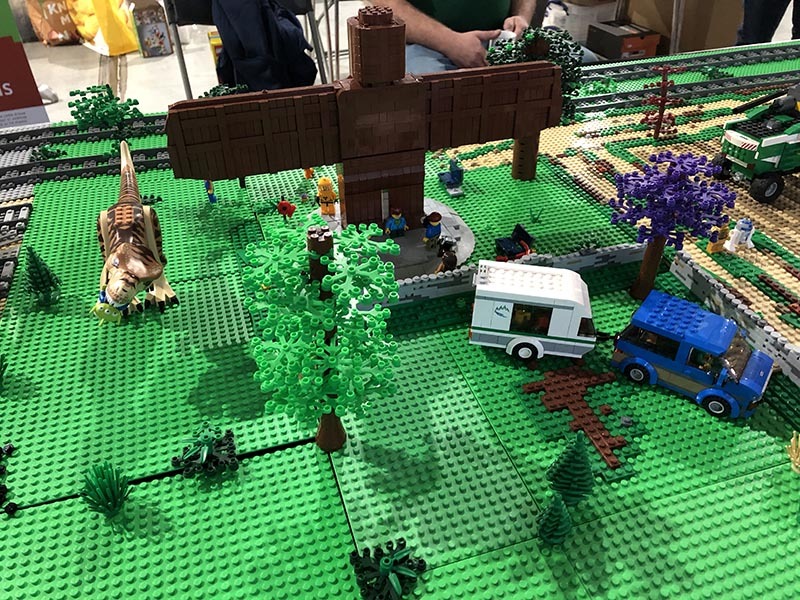 A LEGO model based on the Angel of the North, by Richard Carter. 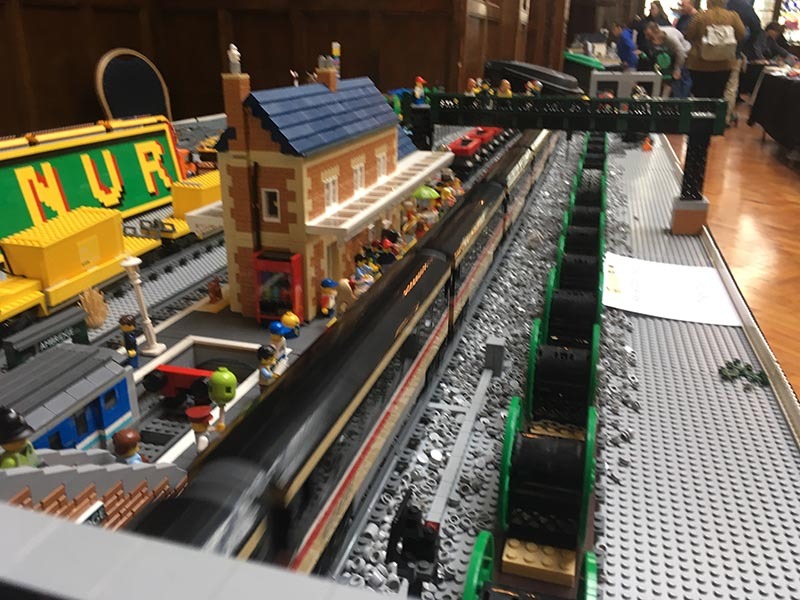 Felpersham Railway Station is a subsurban-style railway station which has appeared at the majority of our displays so far. Featuring an island platform configuration, the station links to a road bridge above it via steps and a lift, and includes full interior detailing such as a waiting room, toilets and ticket office. Another reference the BBC Radio Four’s The Archers, too! A mixture of arable and cattle farming. And yes, the name is based on a location from Radio Four’s The Archers radio serial! 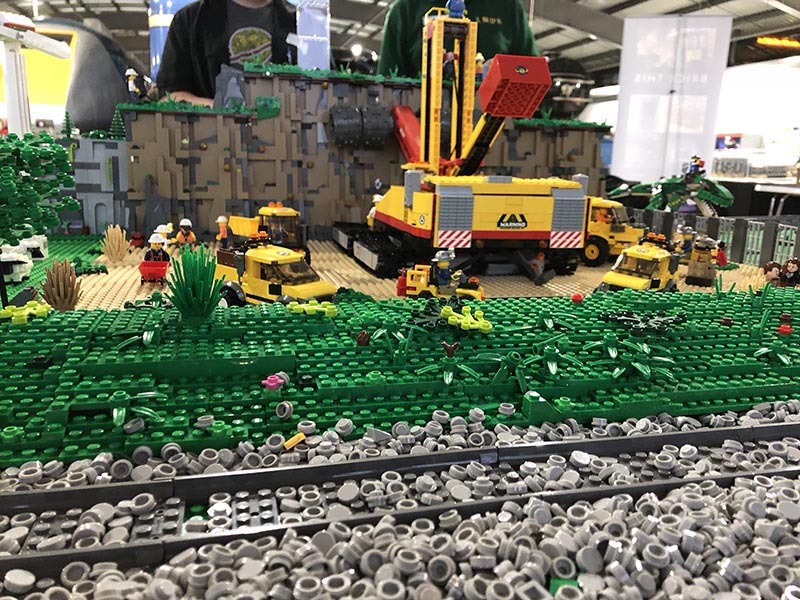 The mine; a currently small landscape module built by Richard Carter to showcase his “Beast”; a doubled-up model of a 2018 LEGO City model. The valley section features a 6ft long double rail bridge, and allows trains to pass over the Am valley below. 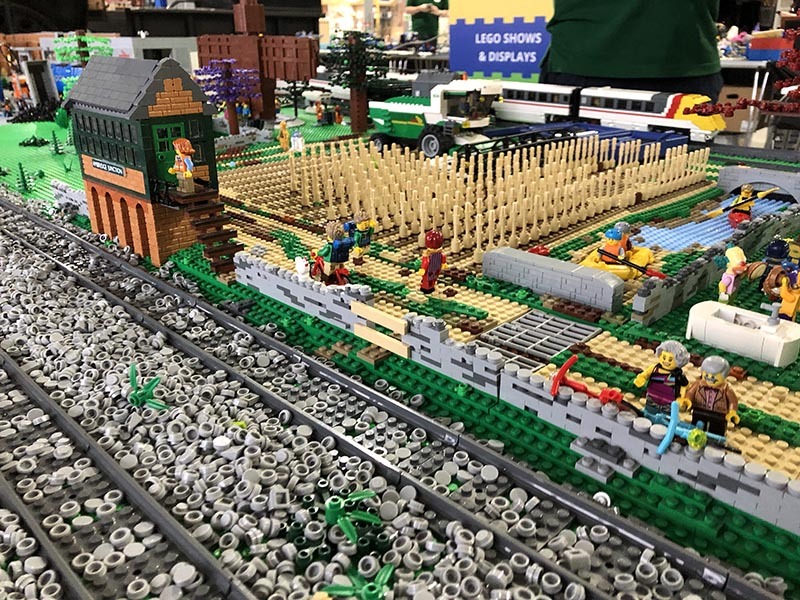 The whole section is 6ft x 3ft, and built almost entirely by member Richard C.
The valley itself features farmland, a cycle track, and our token LEGO pub, with ever-changing names: keep an eye out for it at a show and see what it’s called next! 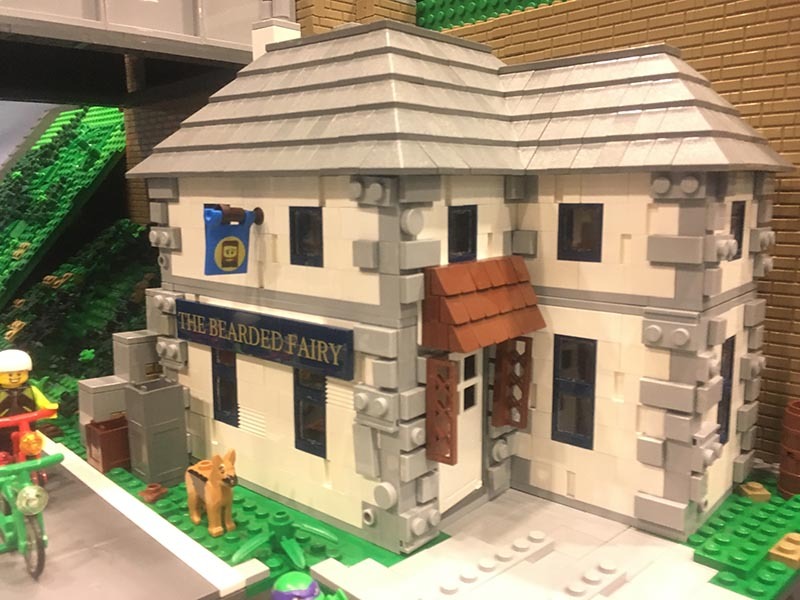 This LEGO pub is where many minifigures spend far too much time and money! Its name changes frequently – often related to the location of our current display. 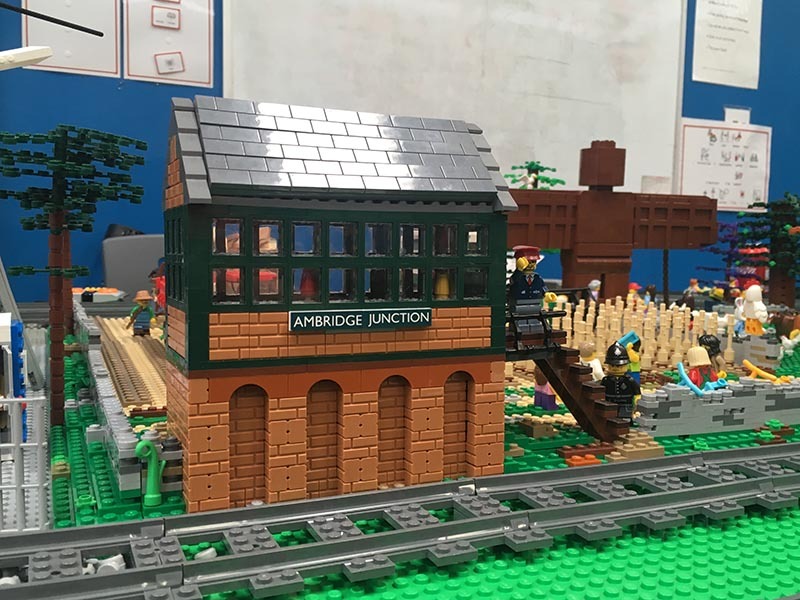 An old favourite; Ambridge Junction signal box. And yet another Archers reference! Felpersham Diesel Depot is a Traction Maintenance Depot usually displayed next to Felpersham Railway Station.